Write Ray! : Trudeau Misses the Boat in Davos! When it comes to a vision of Canada's economic future I think our new Prime Minister missed the boat! In fact, I think he went to the train station! 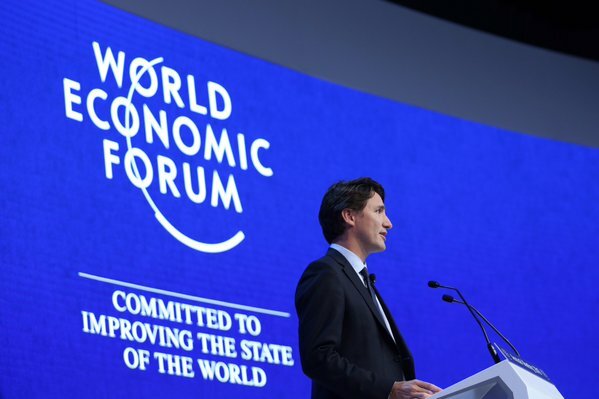 During his speech at an economic forum in Davos, Switzerland, Trudeau said Canada (Canadians) should be known for its (their) resourcefulness, not its (their) resources. It is true that Canadians are very resourceful, that's no secret. But it is our resources that make our country strong! The resourcefulness of Canadians is famous. Many world changing inventions originated here! Everything from the IMAX movie projector to the zipper had its origins here in Canada! However Canada's renewable and non-renewable resources are our biggest export and probably always will be! At that same forum, Calgary's Mayor Nenshi described Canada's economy as "resource plus"! I think our new federal government needs to wake up to that fact and support it. Energy resource exports top the list! Instead of touting Canada's ability to invent computer chips, Prime Minister Trudeau should be forging ways to get our resources to world-wide and other Canadian markets. The two most obvious right now are the two pipelines; the Trans Mountain and Energy East. I was hoping our Prime Minister would announce a government task force to meet with all those supporting and opposed to these pipelines to hammer out an agreement to get them built as soon as possible! The time has come to put down the placards and signs and negotiate a realistic agreement to permit these two vital resource conduits to be built safely and with the utmost concern for the environment! "Canada was mostly known for its resources. I want you to know Canadians for our resourcefulness." "Our natural resources are important, and they always will be. But Canadians know that what it takes to grow and prosper isn’t just what’s under our feet, it’s what between our ears." He did not speak of one at the exclusion of the other, so you're incorrect to say so. He said that they are both important. This is no surprise considering the Liberals' long-standing policy of trying to build made-in-Canada expertise and industries. That stands in stark contrast to the "strip it and ship it" crowd that sometimes predominates the discussion regarding our economy and natural resources.